Google has admitted "we haven't done a good enough job" of "educating" advertisers and other players in the digital media supply chain about where their ads will appear. Ronan Harris, the managing director of Google UK, said it was "working closely" with advertisers, following revelations in The Times last month about how ads from big brands had appeared in front of jihadist videos and other unsuitable content on YouTube. Critics have blamed programmatic media-buying for ads appearing in inappropriate places as brands have used technology to buy audiences without context. Harris insisted advertisers wanted the freedom to reach audiences across the media landscape. "In the conversations we have with agencies and marketers, they want choice – they want to be able to maximise their reach," he told the Deloitte/Enders media conference yesterday. But Harris added: "The distribution chains when you go through the industry have become quite complex. "I’m not sure we’ve done a good enough job to get the balance right between making sure we give everyone maximum choice and educating everyone down through the distribution chain where and when they might show up." 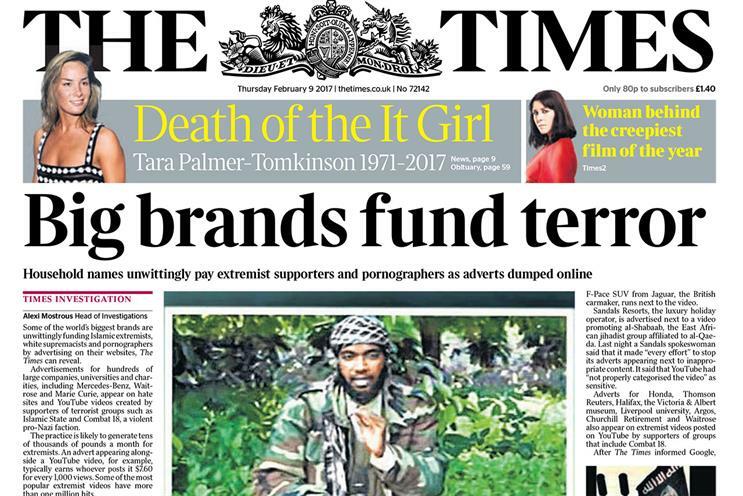 Last month The Times reported that brands are unwittingly funding Islamic extremists and white supremacists with online ads that appear on their websites and videos. Blacklists designed to prevent such ads from appearing on extremist sites are not fit for purpose, according to an analysis by the newspaper. It cited a YouTube ad for the new Mercedes A-Class that ran next to a pro-Islamic State video which was viewed more than 115,000 times.